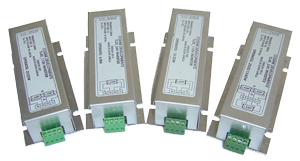 These fluorescent lamp inverters are specifically designed for transport lighting. They feature both transient and sustained over-voltage protection, reverse polarity connection, fusing and lamp failure tolerance. Automatic cut-off protects both the lamp and inverter during both over and under-voltage conditions. The unit is also tolerant to interchanging of lamp and supply connections. Both 24V dc and 110V dc versions are available to power a single 20 W fluorescent lamps (TL20_24V, TL20_110V). The (TL40_24V, TL40_110V) may also be used to power single or double 20W fluorescent lamps. It is housed in an aluminium enclosure with Phoenix plug-in connectors for power and lamp terminations. It is designed to cope with harsh temperature extremes, vibration and “dirty” voltage supplies commonly experienced in transport environments. Lamp ignition is guaranteed through cathode heating and long lamp life is ensured by a near ideal discharge current. The unit satisfies IEC 924, IEC 925 and IEC 60081. Versions are available to drive any fluorescent lamp from 6 to 65 Watts.